Nutritious meals served in a social setting are critical to the health and well-being of our residents. At Benchmark, we go beyond training our kitchen staff to ensure that other key associates know what it takes to create a great dining experience. 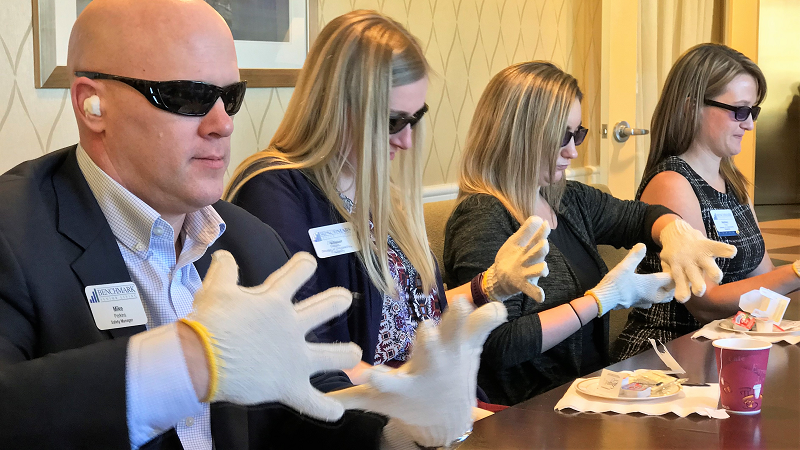 Benchmark’s Emerging Leaders, a select group of high-potential associates, recently attended the “Everything You Wanted to Know About BSL Dining” training at The Commons in Lincoln, Mass. 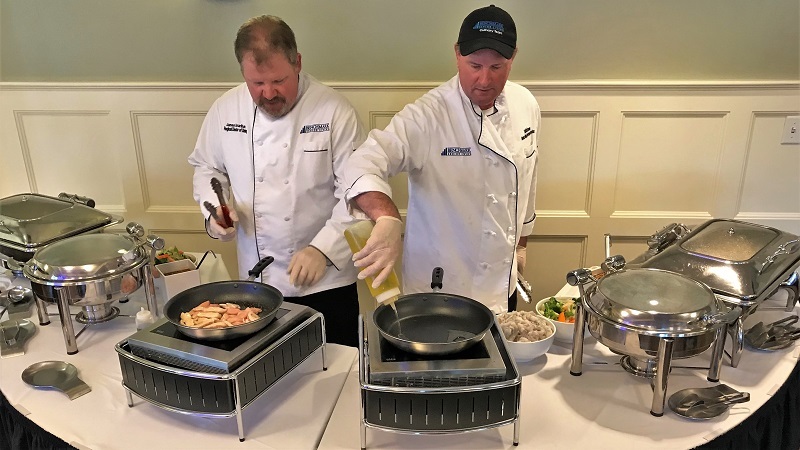 Vice President of Culinary and Dining Experience Guy Hemond and Regional Directors of Dining Services James Hourihan and Mike Eckrote presented all the elements of a great dining experience, such as purchasing, uniforms, menu rotation and family engagement. Here’s a look in pictures of highlights of the training. Students sample foods from our Textured Modified Dining Program. This program provides great tasting and nutritious pureed meals for residents with oral health issues and swallowing difficulties. Red plates enhance the color and appearance of food. This divided “adaptive plate” helps some memory care residents get their food onto their fork. Each dish is molded to look like its original shape. The pizza looks like pizza, the fish looks like fish, and dessert looks like dessert. Elegant presentations help seniors stay focused on their meal. 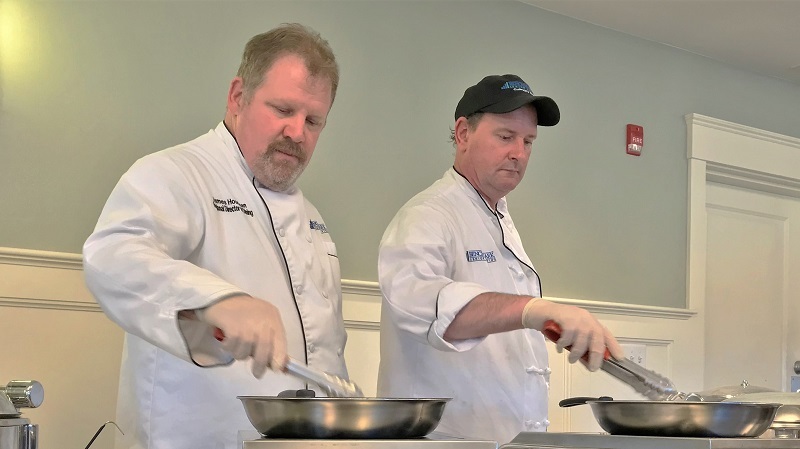 James Hourihan and The Common’s Senior Director of Dining Services Todd McGovern and cooked lunch by demonstrating our Sensory Dining program. Chefs prepare everything from salads to Chinese food to flambé desserts. Sensory Dining moves the cooking from the kitchen to the dining room. Diners hear the sizzle, see the smoke and smell the aroma. You don’t just taste the food; you experience it. Sensory dining is a great alternative to the regular dining routine. 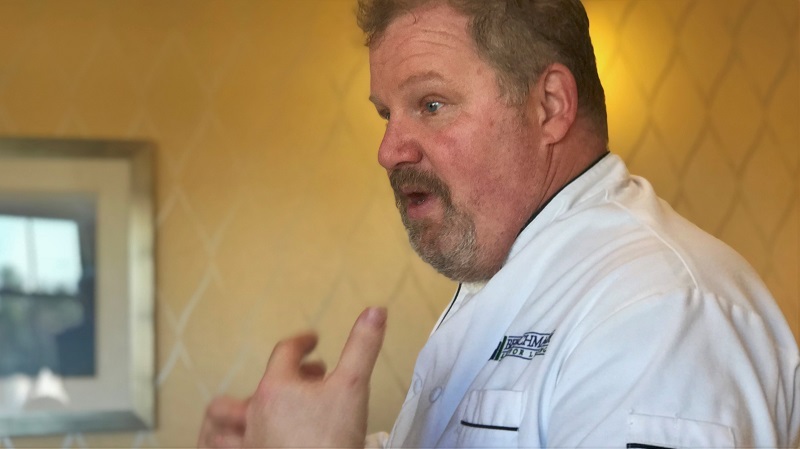 Not only does it stimulate the appetite, it strengthens the human connection between residents and chefs. If you’re giving a tour during a Sensory Dining event, ask the chef to create a tasting plate for your guests. In 2015, one in three seniors admitted to hospitals were malnourished. Seniors with memory disorders are especially vulnerable. And for many seniors, the natural reduction of taste, smell, sight, touch and dexterity reduces the joy of eating. Embarrassed by spills and messes, and too proud to ask for help, seniors may retreat to their rooms, leading to malnutrition, depression, illness, hospitalization and mortality. “Eating at 80” is an eye-opening exercise that helps associates experience and understand the challenges of dining for seniors. Students wear gloves to simulate the loss of feeling. Tongue depressors in a few of the glove fingers replicate the stiffness of arthritis. Add impaired hearing and vision, and the students are ready to begin an exercise in empathy. With limited movement in their fingers, students stir with their arms. Opening the jam and cracker packages, and spreading jam on the crackers is even more daunting. James Hourihan speaks passionately about understanding a resident’s impairments and never mistaking spills and messy eating habits for carelessness. Jim asks students to close their eyes and imagine trying to eat with the impairments they just experienced. “Think about the frustration you felt in just making a cup of tea. This simple thing we do every day and take for granted,” says Jim. “Now imagine you have dementia. You smell the aroma of coffee. You know you want coffee. But you don’t know what to do,” says Jim. For over 20 years, Jim has run the Eating at Eighty exercise for hundreds of associates and family members. He’s improved the exercise by narrowing it to tea and crackers. The traditional end of the class. The Eating at 80 empathy exercise helps servers understand and patiently deal with spills and messes. Families find the exercise helpful in making an informed decision to move a parent into one of our communities. “The exercise helps frustrated family members understand why Mother has become so needy and the kind of care she needs,” says Jim.